WITH supremacy in the Eastern Conference on the line, the Miami Heat showed the Chicago Bulls that they were -- for one night at least -- the top dogs. Led by LeBron James' 27 points, 11 rebounds and six assists, the Heat trounced the Bulls 82-73 Thursday night at the American Airlines Arena in downtown Miami. The win moved the 45-17 Heat to within 1.5 games behind the 47-16 Bulls for the No.1 seed in the upcoming NBA playoffs. Chicago -- playing without MVP Derrick Rose for the 25th time this season -- struggled mightily against a tough and physical Miami defense. The Bulls made only 25 of 70 field goals for a tepid 35.7 percent clip. They missed 14 of 16 treys and converted only 20 of 28 free throws. John Lucas led the Bulls with 16 points, but he took 16 shots to get there. Luol Deng and Carlos Boozer had a rough outing as well, missing 17 of 26 shots. They did have 21 points combined but the Bulls couldn't survive a fourth quarter drought that netted them only 11 points. Miami didn't exactly set the American Airlines Arena on fire, but the Heat shot better at 42.1 percent (32-of-76 field goals). The Heat also sank two more 3s (4-of-13) and they didn't miss as many free throws (15-of-21). More importantly, the Heat out-rebounded the Bulls 45-40 and they played with more passion on both ends of the floor. "That's what the playoffs are going to be about. When someone pushes their foot on the gas and tries to push us back, we have to push even harder. We definitely have to get better at that," said Bulls guard Rip Hamilton of the game's playoff-type atmosphere which saw four technical fouls and an ejection. 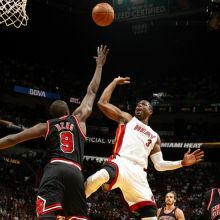 "Typical Eastern Conference basketball game in late April," Miami head coach Erik Spoelstra told NBA.com. "It was a good win. Both teams had to fight through some injuries. Everybody out there obviously was competing,: he added.